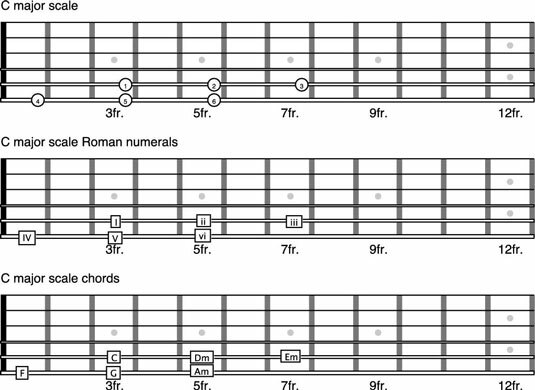 It’s easy to build a new chord pattern that starts on the 5th string of the guitar. The chords and scale degrees are still drawn from the major scale. The numbers stay the same, too. But the pattern looks and feels different because chords I, ii, and iii are placed on the 5th string, while the others — IV, V, and vi — get moved over to the 6th string. Starting on the 5th string gives you better access to some keys by allowing you to play them in more comfortable positions. You start in the key of C with chord I at the 3rd fret of the 5th string, as shown here. This example also includes the viif5 chord so you can complete the scale, but it won’t be used once you begin playing chord progressions. 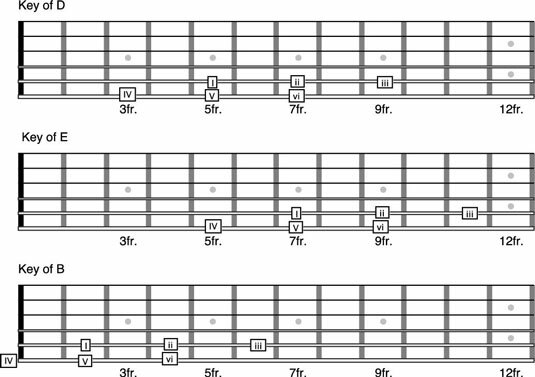 Here is what the same chords look like as a fretboard pattern. You focus on using only the first six chords on the fretboard because viif5 is rarely, if ever, used. Take a moment to play through this pattern forward and backward while calling out the numbers as you go. Generally speaking, you use this new chord pattern in keys that would reach too high on the fretboard when based on the 6th string. For example, in the keys of B, C, and D, it’s difficult to reach up to the iii and vi chords. Plus, barre chords near the 12th fret are voiced too high — that is, they sound too high-pitched for most rhythm playing. Here, you move this pattern around and play in some different keys. Notice that the same pattern also works in the key of B, using an open E chord on IV. You always need to think about using open strings! This next list has songs that not only use minor chords but center on one, mostly chord vi, creating minor keys.